Economic and Financial Crimes Commission (EFCC) investigators probing ex-First Lady Patience Jonathan’s link with five choice buildings, including a N5billion hotel in Abuja, have unearthed seven additional properties believed to be owned by her. The detectives were in Port Harcourt (Rivers State) and Yenagoa (Bayelsa State) all week trying to establish whether four properties in the two cities truly belong to Mrs. Jonathan. The Nation can now confirm that the assignment led the investigators to suspect that seven more properties including the former Customs Service officers mess in Port Harcourt and a plot of land under construction were acquired by her. Others in the Rivers State capital are: two duplexes at 2/3 Bauchi Street; landed property with blocks at Ambowei Street; three Luxury apartments of 4-bedroom each at Ambowei Street; and Grand View Hotel on Airport road. Those in Yenagoa are: two marble duplexes at Otioko GRA by Isaac Boro Expressway; Glass House on Sani Abacha Expressway which serves as office of the Nigerian Content Development and Monitoring Board; Akemfa Etie Plaza by AP filling Station, Melford Okilo Road; and Aridolf Resort, Wellness and Spa along Sani Abacha Expressway. The anti-graft agency, which says it has so far recovered N1b and secured 24 convictions in the South South, may invoke Section 7 of the EFCC Establishment Act 2004 on the affected properties after due verification, sources said yesterday. Already, the EFCC has written to the Head of the Civil Service in Bayelsa State demanding the pay status and allowances of Mrs. Jonathan during her tenure as a Permanent Secretary. It also sought explanation on whether or not she was paid in dollars, besides travelling estacodes, while in office. The investigators are already back in Abuja to continue their assignment. A highly placed source said: “The ex-First Lady is allegedly linked with the acquisition of the former Customs Service Officers mess in Port-Harcourt. “We also identified three luxury apartments of four-bedroom each believed to be owned by Mrs. Jonathan. The apartments are tastefully furnished with the state of the art accessories. “After verification of these assets and completion of our investigation, we may seek the order of the court to place the affected assets under Interim Forfeiture. “Permission will be sought to ask the ex-First Lady to explain some of the sources of her wealth in line with Section 7 of the EFCC Establishment Act. The Nation also gathered that the EFCC last Friday submitted a letter to the Head of the Bayelsa State Civil Service demanding the pay status and allowances of Mrs. Jonathan as a Permanent Secretary. A top source said: “The letter was submitted and duly acknowledged. We already have the acknowledgement copy with us for record purpose. “We asked for Mrs. Jonathan’s salary and remuneration status as a Permanent Secretary while in office. We demanded to know if she was paid in dollars or in any other currency. Section 7 of the EFCC Act says: “The commission has power to (a) cause any investigations to be conducted as to whether any person, corporate body or organization has committed any offence under this Act or other law relating to economic and financial crimes. This is the second leg of the ongoing probe of Mrs. Jonathan after about $19.8million had been frozen in five accounts allegedly traced to her. Although she initially confirmed the ownership of the accounts, there was a twist on Friday when her counsel, Mr. Charles Ogboli, said she knew about three accounts including one belonging to Mrs. Jonathan and two others owned by her late mum, Madam Charity Fyneface Oba. A report of the EFCC investigative team had implicated the former First Lady. 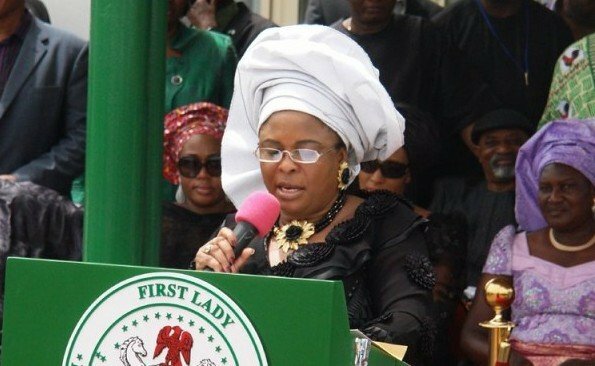 The report of the investigative team said in part: “Based on the investigation so far carried out, it has revealed that the four fraudulent VISA Platinum USD Card accounts used by Mrs. Patience Goodluck Jonathan has a cumulative balance of $14,029.881.79 which has been swept Post No Debit Card category. “Again, her personal account, different from the four fraudulent VISA Platinum USD Card accounts, bears the balance of $5,841,426.17. The EFCC claimed that all the funds traced to Patience Jonathan’s accounts were proceeds of gratification. Meanwhile, the Zonal Head of the EFCC in the South-South, Mr. Ishaq Saliu has said that the zone has so far secured 24 convictions and recovered N1billion. Saliu made the disclosures in Port Harcourt when some Niger Delta youths protested to his office on Friday against the ongoing investigation of the former First Lady, Mrs. Patience Jonathan. He dismissed allegations that the EFCC was selective in its investigation and prosecution. He said the EFCC will always be on the side of the law in its operations. He said: “There is nothing selective in the cases of EFCC. We are professionals to the core. Once an allegation is made, before somebody is even invited – the invitation is the last leg of our cases. Mr. Dami as he is normally called is currently majoring in Physics, and also an editor here on this news platform. He finds writing business news, science and tech as an hobby which he thrives at. Follow to get more of published content by him.